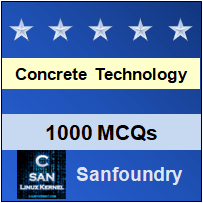 This set of Concrete Technology Multiple Choice Questions & Answers (MCQs) focuses on “Standard Consistency Test”. 1. Why do we need Standard Consistency Test? Explanation: This test is performed to determine the quantity of water required to produce a cement paste of standard or normal consistency. 2. What is standard consistency? Explanation: Standard consistency of cement paste may be defined as the consistency which permits the Vicat’s plunger (10 mm, 40 to 50 mm in length) to penetrate to a point 5 mm to 7 mm from the bottom ( or 35 mm to 33 mm from top) of Vicat mould. 3. When the cement paste is tested within the gauging time. Here what is the value of gauging time? 4. How many moulds required for compression strength test of cement? Explanation: In this test, three moulds of (face area 50 cm2) are prepared and cured under standard temperature conditions and each cube tested by placing it between movable jaws of the compressive strength testing machine. 5. Which of the following option is correct? Explanation: To determine the standard consistency, we need to divide the weight of water to cement and then multiply it with 100 to get the percentage of standard consistency. Explanation: The standard consistency of a cement paste is defined as that consistency which will allow the vicat’s plunger to penetrate to a point 5 to 7mm from the bottom of the vicat mould. 7. Calculate standard consistency(%) when 100 ml of water is added in 1000 g of cement. 8. For making cement paste, what is the amount of water we need? Explanation: 25% water by weight of dry cement thoroughly to get a cement paste. Total time taken to obtain thoroughly mixed water cement paste. 9. What is the normal consistency for OPC? Explanation: For a cement paste the standard consistency is measured by flow table test which ranges from 26 to 33%. 10. The relative humidity of laboratory should be ___________ for standard consistency. Explanation: Unless otherwise specified this test shall be conducted at a temperature 27 + 20 C and the relative humidity of laboratory should be 65 + 5%.